Our Black Tea Vitalising Conditioner for all hair types leaves hair shiny and manageable while imparting moisture and nourishment. 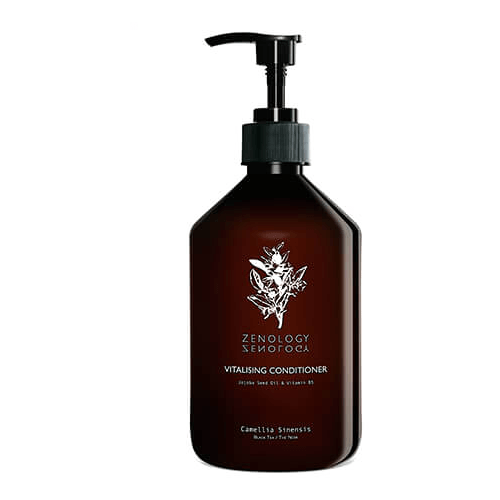 Formulated with Jojoba Seed Oil, this replenishing conditioner energizes hair while leaving it feeling refreshed and healthy. Jojoba Seed Oil – Balances scalp’s natural oil production, leaving it not too oily nor dry. Vitamin B5 – Moisturizing and helps to fight hair static. Our conditioner for all hair types leaves hair shiny and manageable while imparting moisture and nourishment. Formulated with vitalizing Jojoba Seed Oil, this replenishing conditioner energizes hair while leaving it feeling refreshed and healthy. A very mild yet effective ingredient known for its de-tangling and hair thickening properties. Because this ingredient directly deposits onto the hair follicle to smooth out the cuticles, it’s highly regarded for its conditioning abilities. Jojoba seed oil is similar to the natural oils that can be found on our skin and has the ability to moisturize the scalp, hair and its follicles without leaving it either too oily or too dry. It also helps hair cells to reproduce themselves at a rapid pace. Apply an amount of this creamy, conditioner, work through the mid-lengths and ends after shampooing. Rinse thoroughly with luke warm water so hair will instantly be disentangled, smooth and vitalised. Aqua, Cetearyl Alcohol, Glycerin, Parfum, Behentrimonium Methosulfate, Inulin, Phenoxyethanol, Hexyl Cinnamal, Simmondsia Chinensis Seed Oil, Panthenyl Hydroxypropyl Steardimonium Chloride, Ethylhexylglycerin, Panthenol, Geraniol, Linalool, Schizophyllan, Citric Acid, Sodium Hydroxide.